Wow! What a great Christmas present, Magic Holiday. 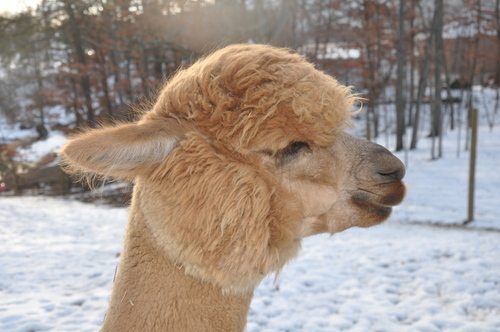 This handsome herdsire has it all: great bloodlines, great conformation, and great fleece. His sire, Rensselaer, is one of the few P3 White Lightning descendents. Like his sire, Magic has retained fineness, crimp, bundling, and luster. His 2006 AFD is 19.7 and his 2010 AFD is 22.6. Our NAAFP sorter this year stated “nice brightness with good hand--uniform micron”. He does pass these outstanding qualities on to his cria. To date two of his cria have been entered in competitions. His first daughter received First Place and Reserve Champion at the Georgia Royal Alpaca Challenge 2010.One son was awarded First Place and Reserve Color Champion at MAPACA 2011 Fleece Show. Judge Gehly comment-“Wonderfully soft, fine, uniform, bright, dense fleece! Wow!” He was also awarded First Place at the AOBA National 2011 Fleece Competition. Judge Timmerman comments-“Good crimp style with density. Beautiful brightness and good weight for age”. For those dark colored dams, Magic does let the dam’s color pass. Put some Magic in your breeding program.